The Last of the Really Great Whangdoodles was the second children’s novel ever written by Julie Andrews, the beloved star of Mary Poppins and The Sound of Music. Perfect for young readers who love whimsical stories about magic! 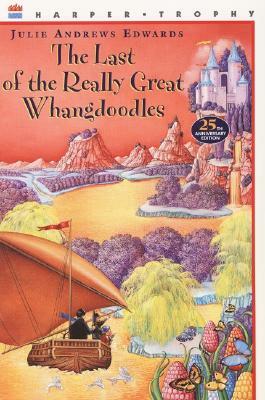 The Whangdoodle was once the wisest, the kindest, and the most extraordinary creature in the world. Then he disappeared and created a wonderful land for himself and all the other remarkable animals—the ten-legged Sidewinders, the little furry Flukes, the friendly Whiffle Bird, and the treacherous, "oily" Prock. It was an almost perfect place where the last of the really great Whangdoodles could rule his kingdom with "peace, love and a sense of fun"—apart from and forgotten by people. The novel was originally published in 1974. This edition includes a foreword by Julie Andrews. Julie Andrews Edwards is one of the most recognized figures in the world of entertainment. She is perhaps best known for her performances in Mary Poppins, The Sound of Music, and The Princess Diaries. Ms. Edwards is the author of many favorite children's books, including Mandy, The Last of the Really Great Whangdoodles, and the Little Bo series. She and her daughter, Emma Walton Hamilton, an arts educator and theater professional, have coauthored over twenty books for young readers, including Simeon's Gift, The Great American Mousical, Thanks to You: Wisdom from Mother & Child, and the recent New York Times bestsellers The Very Fairy Princess and Julie Andrews' Collection of Poems, Songs, and Lullabies. Emma is also the author of Raising Bookworms.